CONTAINING more than 2000 words and expressions, Persian: Here and Now is a course book that provides first year students with both language and cultural proficiency. The components of the book use a communicative framework, with an emphasis on the functional constituents, to integrate both notional and structural elements in each lesson. These elements have been interwoven to produce reading units with a very natural linguistic texture. The characters in the book communicate through various real life situations enabling them to express themselves as real people in the target language. Illustrated in full color, each lesson is designed to be an open learning space for both teachers and students to be flexible within the curriculum. Instructors can creatively alter or expand the components of this book according to the class’s needs and the students’ interests. Furthermore, all the reading units and communicative activities also have a pedagogical side-note that makes suggestions on implementation to instructors. 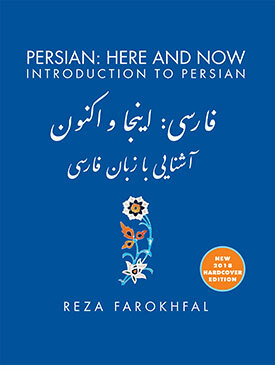 Persian: Here and Now contains a glossary and a guide to the most common, basic Persian verbs (listing their past and present stems), and provides students with an audio clip for each reading unit. This book is designed to help first year students attain language competence as stipulated by the American Council on the Teaching of Foreign Languages. “… [Persian: Here and Now] does an extraordinary job incorporating various aspects of modern approach to second language teaching, which, unfortunately, most of other Persian language textbooks currently available on the market lack. The topic-based presentation of the material will be greatly appreciated by the students as well as teachers. Numerous notes and quick facts about the peculiarities of Persian syntax and phraseology, especially about the differences in the use of most common expressions in Persian and English are very helpful for learning authentic Persian. I find the presentation of grammar in the textbook unimposing yet helpful and clear. Just as it should be. Incorporating various aspects of the culture of the target country is indispensible in a language class, and, I think that the book does a truly marvelous job presenting culture in a natural, interesting and helpful way that will facilitate the overall process of learning the language. I thought that in terms of structure, organization, and content the book has definite and clear advantages over other textbooks of Persian. …Thank you again for doing so much for the advancement of Persian language teaching in the country.